Published: Jan. 1, 2012 at 09:48 p.m.
(12:52) I.Redman up the middle to CLV 49 for no gain (C.Gocong). FUMBLES (C.Gocong), RECOVERED by CLV-E.Hagg at CLV 42. PENALTY on PIT, Face Mask (15 Yards), 15 yards, enforced at CLV 42. 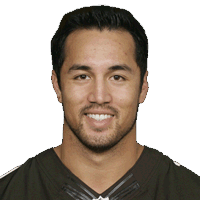 Published: Jan. 1, 2012 at 07:00 p.m.
Browns LB Chris Gocong forces a Pittsburgh fumble that is recovered by DB Eric Hagg at Cleveland's 42-yard-line. Published: Dec. 4, 2011 at 07:29 p.m.
(7:19) R.Rice right guard to CLV 26 for no gain (C.Gocong; P.Taylor). Published: Nov. 13, 2011 at 07:47 p.m.
(10:47) (Shotgun) S.Bradford pass to S.Jackson to CLV 30 for 5 yards (C.Gocong). FUMBLES (C.Gocong), RECOVERED by CLV-C.Gocong at CLV 29. C.Gocong to CLV 29 for no gain (A.Pettis).